The Iogear 2-Port Dual-Link DVI KVMP Pro with 7.1 Audio allows you to control 2 computers using a single monitor, keyboard, and mouse. Ideal for multimedia applications, the switch supports an integrated 2-port USB 2.0 hub and audio switching. Offering a maximum resolution up to 2560 x 1600 (DVI-D Dual link) and 1920 x 1200 (DVI-D Single link), the KVMP Pro supports high-end 3D graphics (NVIDIA 3D Vision Ready) and gaming keyboards. Asynchronous hotkey switching can be done between KVM focus, USB peripheral, and audio ports. You can experience and share the 7.1 surround sound system between 2 computers. The Dynasync feature with EDID support for Windows 7 reads and remembers the monitor's parameters so that there is no delay or change of video resolution when switching between, or booting computers. Complete keyboard and mouse emulation is possible for error-free booting and real-time switching. The front panel pushbuttons / hotkeys help you switch between computers. The KVMP Switch is also compatible with the MAC / Sun keyboard and special keys. It supports a multi-platform OS including Windows XP, Windows Vista, Windows 7, Mac OS X, Sun Solaris, and Linux. The switch is firmware upgradeable. With the Plug-n-Play installation, no software is required. The 2-Port Dual View Dual-Link DVI KVMP Pro with 7.1 Audio is ideal for CAD (Computer Aided Design) and CAM (Computer Aided Manufacturing), desktop publishing / graphic design / video editing, medical / surgical / diagnostic displays, and high-end gaming, where high and ultra-high video resolutions are required. 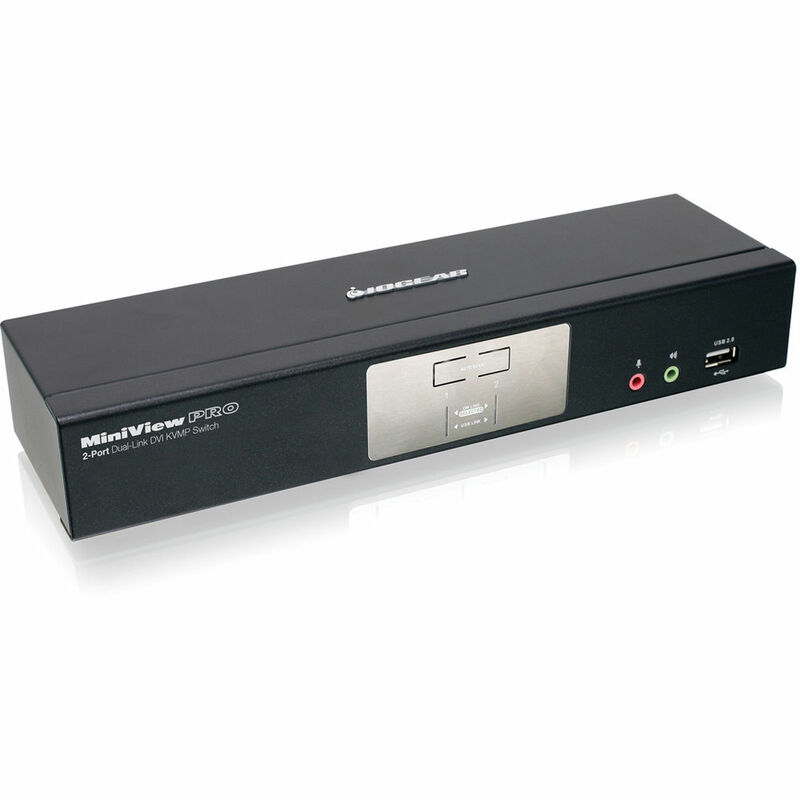 Box Dimensions (LxWxH) 13.0 x 8.5 x 4.0"
2-Port Dual-Link DVI KVMP Pro with 7.1 Audio is rated 3.5 out of 5 by 2. Rated 3 out of 5 by Xentonum from for standard hardware only... Pros: * Good construction * Good quality cabling included. Cons: * Says it supports gaming keyboards, but only standard key/mouse operation. (No support for Logitech G510 features, for example.) * Inconsistent support for USB devices. Some that work on PC don't work on MacBook Pro (APC40) I've resorted to using this just to switch my 30 display, which this does without issue using the front panel button. Rated 4 out of 5 by Windy City from Couldn't manage without it This KVM switch provides a manual switching mode in addition to use of a hotkey. Since I use a Mac keyboard with a PC, I needed the manual switch option to operate the switch. It also has USB connections and DVI input for my monitor. Now I can use one monitor, keyboard and mouse for two CPUs easily and conveniently.